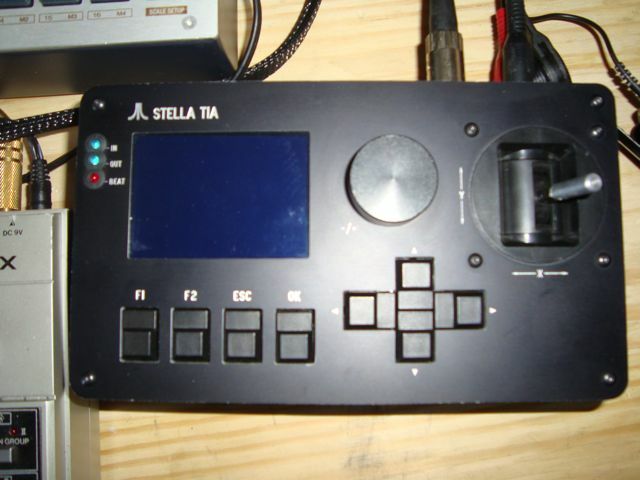 All about midibox TIA ! I'm sorry for the wait, some of you would not believe it. You will find on the wiki all the "Cartridge" completed. Some of you will find their nickname in the bulk order list. If you still wish it, complete the options if not erase your line. And I will calculate final price for each one of you asap. 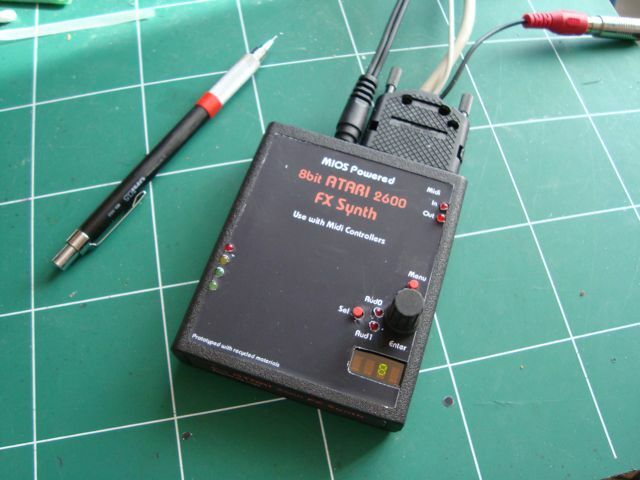 I finished mine last night, and will spend today playing around with the Max/MSP manager. Please add those things, as described here "Please Read Before Posting New Topics: What is a "User Project"? I'm probably a bit nostalgic for a time I played the game console in the living room of my parent. Need electronic sounds that have traumatized my childhood. A friend of mine recently reminded me that I had promised to make one for him(another nostalgic). So I resumed work in late 2010, after checking that no one already did. The first question was whether I was able to program it into MIOS. I tried and succeeded. Then I searched for housing. Why not in a game cartridge of the era!!! So i try it too. AND it fits in the box. I'm very proud to be officially a midibox programmer. Thank you. I'm the king of the world... :queen: hihi ...Seriously It makes me really happy. I hope you will appreciate my work too. The Wiki page looks great. Your project is very near and dear to my heart, Thank you for such a fine project. Your presentation on the wiki is top notch, especially like the MB TIA Manager. This def goes on my 'bucket list'!! Bravo antichambre! super boulot! je viens de revenir de toulouse ou je tafais et j'ai vu ton mail alors je suis venu voir les photos et j'avoue que Ã§a Ã de la gueule en plus! En tout cas super projet! C'est marrant avant que jparte sur toulouse ya 2 jours j'Ã©tais tombÃ© sur ta video sur youtube mais j'avais pas vu que c'Ã©tait toi j'avais dÃ©ja bien aimÃ© la dÃ©mo je vais me pencher dessus et aller voir le wiki de plus prÃ©s! Ã bierntÃ´t! I wanted to clean it before publishing, and file it in SVN. But I have not had time. This first version compiles two setup. - One for the base version, for wiki schematics(TK style). - One for the cartridge version. There's extra tools too for testing your board, interconnection and testtone! You can control it by midi. see midi table in doc folder. and the same manager in app for Mac user only. This part is on my google drive cause it's too big for the wiki media manager. Oh i forgot to say that the manager is iPad ready! Just download c74 app from your app store. I having problems with the interface that is connected after the 10uf caps (C2 C3), where does the A1 and A0 come from? Is it the TIA A0 and A0 pins (31,32)? 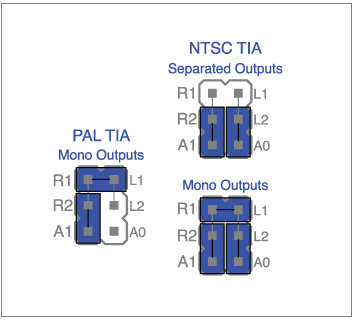 Or is it just to help understand the 3 configurations for the different TIA chips? Eptheca is right on a PAL pin 12 is for video carrier, don't use it! The two voices Aud0/Aud1 are mixed internally and outputted on pin 13. 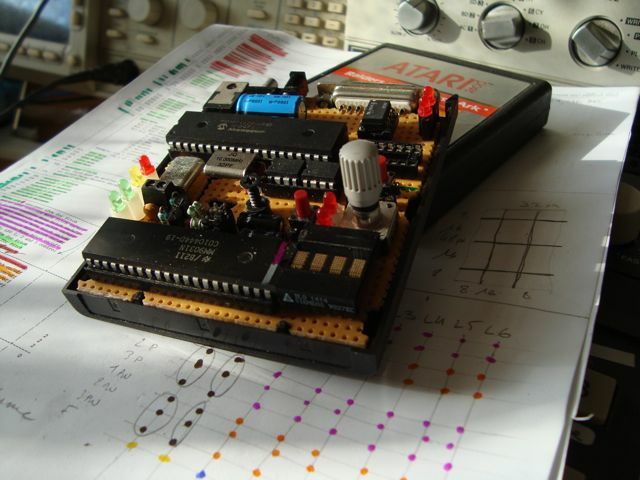 A0/A1 (pin 31/32) are the LSB adress bus and must be connected to the shift register. 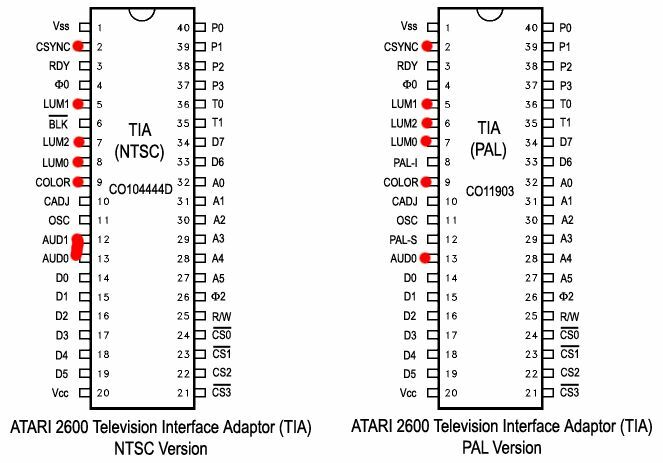 I made a mistake on the schematics, the blue jumper is on A1/R2 for PAL one, sorry. it's all about making one dude! it will be all that more loved when completed with your own hands and much to be learned along the way! just jump in with a core module and a TIA chip! Anyone in UK flash me MIOS 1.9 to my PIC as I cannot update using my 'ancient' PCB's and JM module?